Nov 2, 2018 | What Am I Reading? 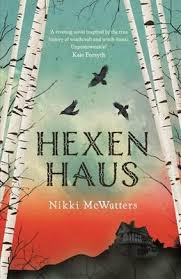 Hexenhaus (UQP 2016) is a fictionalised tale of witchcraft anchored on true events, by author Nikki McWatters, who has woven together three different tales, based on three young women living in very different times. In 1628, after their parents are burnt at the stake for their beliefs, Veronica and her brother Hans flee into the safety and anonymity of the woods in Germany. Tainted by their family’s reputation, Veronica begins to discover her own healing power. In 1696, in Scotland, Katherine is pursued as a witch after a child in her care exhibits strange behaviour. And in present day Australia, teenage Paisley struggles to deal with her new-age hippy mum who runs an alternative healing shop and is blamed for the disappearance of a boy she had counselled. Paisley’s absent dad shows up and things get a little weird. This is YA fiction, although the themes and historical accounts of torture and deprivation are visceral and authentic, and may not be suitable for younger readers. But for adolescents, this book offers a tantalising and dark exploration of the origin of the term ‘witch-hunt’, and depicts how real life historical characters were caught up in the religious and pious fervour of the day. McWatters cleverly transposes this with alternating chapters of the present day, with a mirrored view of how ‘witches’ (ie anyone alternative or different) might be perceived and treated. The book could almost be three separate stories combined. First we have a chapter from Veronica’s perspective, then from Katherine and finally from Paisley, and this continues throughout. And while the girls are each from very different circumstances and times, their journeys progress with somewhat similar challenges and difficulties. Each of them must confront the fear and persecution of the political and religious beliefs of the day. Each faces prejudice and gossip. And despite the very different times in which they live, each has a strong connection to family and loved ones, each values loyalty and trust, each faces betrayal. Veronica, Katherine and Paisley each have a romance attached to their narrative also, and it is somehow so gratifying to read about three young women from such different lives who nevertheless share the same feelings, doubts, hopes and dreams. On one level, this is an historical novel based on solid research about the European witch-hunt trials and the trauma of that time. But on another level, it draws parallels with modern Australian life, and with the current zeitgeist of the embracing of difference versus the fear and panic of the unknown or unfamiliar. I was drawn into each of the girls’ stories. I found the two historical stories compelling and fascinating, rich with detail of the time, very descriptive and full of sensory elements. Paisley’s tale added a regular and welcome light relief to the book – her story is relatable and funny, and provides an opportunity to escape from the darker sections of Veronica and Katherine’s lives. But I think what McWatters has done really well is to highlight the similarities between these young women, not in the particulars of their situations, but in the broad brushstrokes of how they are seen by the world, how they represent themselves, how they fight for what they believe to be right and true, how they suffer for their beliefs, and the loyalty they show to those they love. They may live centuries apart, but their circumstances – their hurts and disappointments, their small successes and achievements, their dreams – transcend time. This book is such a great way to demonstrate how our differences unite us, how history is real and being made all the time. It shows the similarities of these girls’ lives, despite the years and countries separating them. If you have a young person interested in witchcraft, this is an enthralling read that also satisfies with plenty of historical accuracy and facts. And it is perhaps a timely lesson about intolerance and misinformation, misunderstandings and folklore, prejudice and fear.